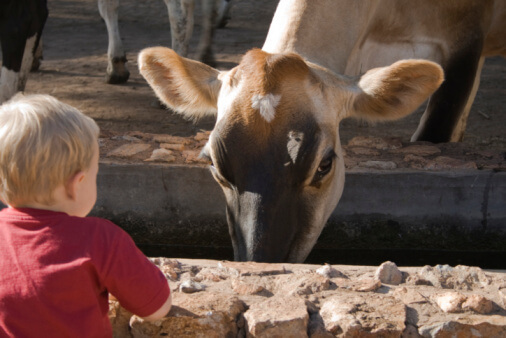 Regular contact with farm animals is associated with a dramatically lower risk of a young child’s later developing an inflammatory bowel disease (IBD) such as Crohn disease (CD) or ulcerative colitis (UC), according to a fascinating study in the August 2007 Pediatrics. This is consistent with previous studies that showed early contact with farm animals could lower the risk of asthma, eczema, and allergies. The theory that children living in environments that are too sterile tend to develop more allergic and autoimmune diseases is called the hygiene hypothesis . Exposure to a variety of microbes could be important while the young immune system is learning how to react. Crohn disease and ulcerative colitis are autoimmune conditions, where the body’s immune system mistakenly attacks the person’s gut.